This unusual and interesting name is Anglo-Saxon in origin, and can be either a locational or topographical surname. If locational, it derives from the place called "Hauxwell" in North Yorkshire, which is first recorded in the Domesday Book of 1086 as "Hauocheswelle". The placename means either "Hafoc's spring or well" or "the hawk's spring", derived from the Old English pre 7th Century personal name H(e)afoc, meaning "hawk", from some resemblance to the bird, or "heafoc", the hawk, with "wealla", a spring, stream or brook. As a topographical surname, the meaning is "dweller by the hawk's well or spring". 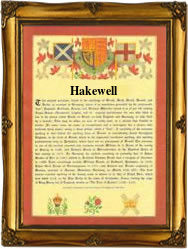 The modern surname can be found as Hauxwell, Hawkswell and Hockswell, and the later forms, where the "s" has been dropped, Hackwell, Hakewell and Hockwell. The marriage of James Hackwell and Anna Harris was recorded at St. Dunstan's, Stepney, in London, on January 7th 1640, and Mary Hackswell was christened at Leake in Yorkshire on February 16th 1681. The first recorded spelling of the family name is shown to be that of Peter de Haukeswell, which was dated 1272, in the Book of Fees for Kent, during the reign of King Edward 1, known as "The Hammer of the Scots", 1272 - 1307. Surnames became necessary when governments introduced personal taxation. In England this was known as Poll Tax. Throughout the centuries, surnames in every country have continued to "develop" often leading to astonishing variants of the original spelling.